It's been a humid few days so I was in the mood for a cold soup this week. I wanted a Spanish gazpacho-style soup, thickened with bread and almonds (similar to this Cordoban Gazpacho). Cool, creamy and slightly smoky. I have been slightly obsessed with Old Bay Seasoning lately (the low-salt one)--adding it to hummus (recipe coming soon), mixing it into my scrambled eggs and tuna salad--I like its zestiness and the combination of flavors. 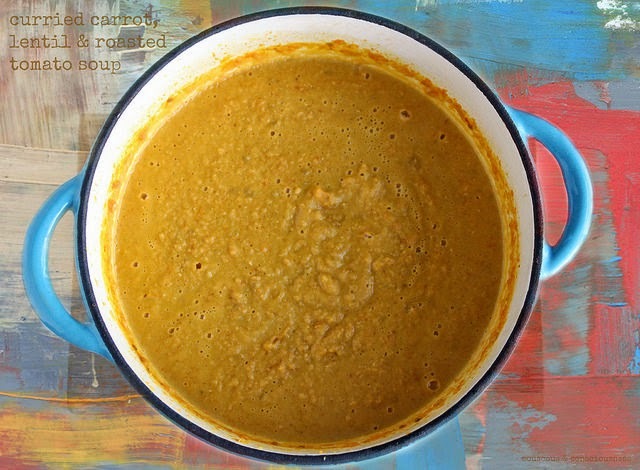 I thought it would be a great addition to this soup, with a bump-up of smoked paprika. Another recent obsession, Creamy-Basil-Caper Sauce adapted from a Nigel Slater recipe. I loved it over pasta and knew it would be a great piquant contrast to the sweet and smoky soup and chopped hard-boiled egg. Using a paring knife, make a shallow "X" on the bottom of each tomato. Blanch tomatoes for 30-40 seconds in boiling water. Transfer to a bowl of ice water to cool. Once cooled, drain, peel and chop tomatoes. Place tomatoes in a blender jar with sweet onion, garlic, tomato paste, bread, toasted almonds, vinegar, oil and spices. Puree until smooth. Season with salt and taste. Refrigerate until very well chilled, at least 2 hours. 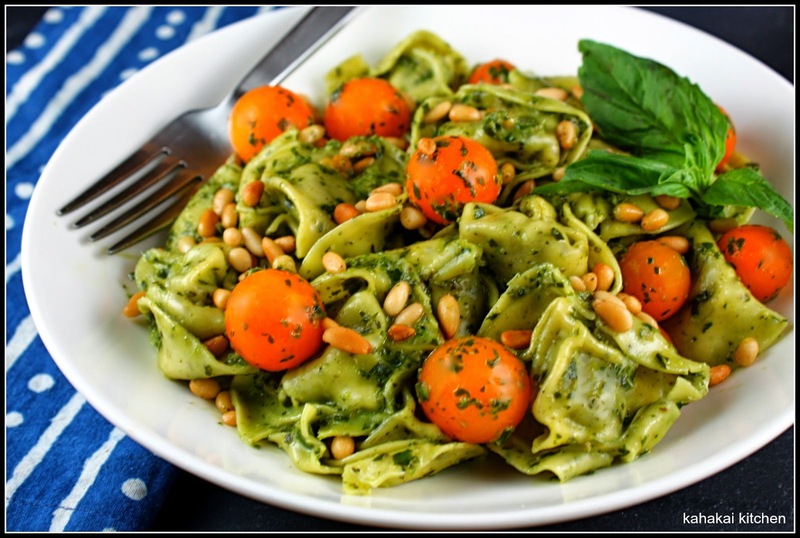 Basil leaves, a good couple of handfuls, a clove of garlic, a teaspoon of Dijon mustard, a couple of tablespoons of white wine vinegar, a tablespoon of capers, pureed with enough olive oil to make a thick pouring consistency. Stir in 2 or 3 tablespoons of cream and some salt and pepper. Notes/Results: Not everyone is a gazpacho or cold soup fan but if you aren't or haven't tried cold soups before, this is the way to go. The bread and almonds add a creaminess that soften the edges of gazpacho and make it rich and indulgent. So good. The smoky-sweet combination is wonderful on its own but even better with the toppings. It takes just minutes to make and the only cooking is blanching the tomatoes. 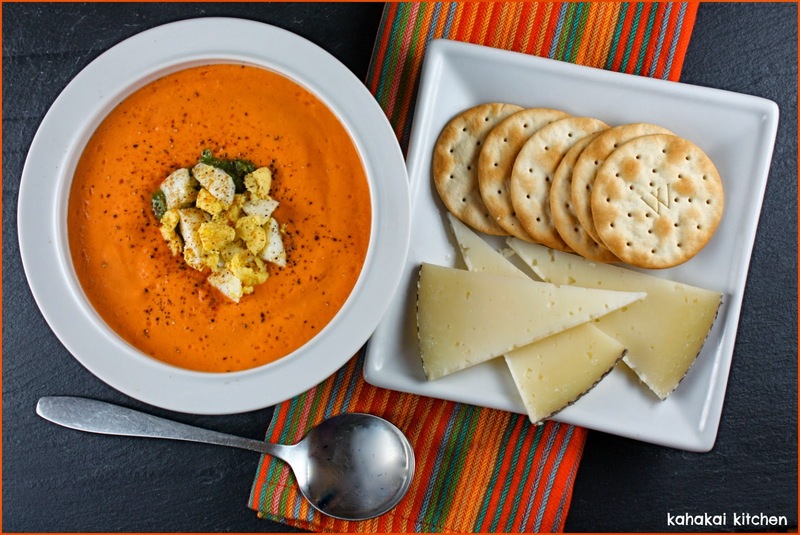 Serve this soup as a starter for an outdoor dinner on a warm night, maybe with some crackers and Spanish Manchego cheese. This totally hit the spot--I will make it again. Let's take a look in the Souper Sundays kitchen and see who is here. Foodycat is here with a delectable Fried Prawn Salad and says, "I haven't deep-fried anything in ages, so I thought topping a big meal-in-a-bowl salad with marinated fried prawns would be a good Friday night treat. And it was. 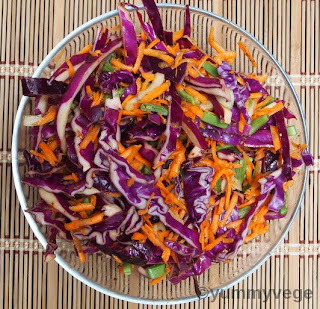 There are a couple of new-to-me features about this salad - one ingredient and one technique. The ingredient is this avocado oil flavoured with chipotle, which mexgrocer.co.uk recently sent me to try. It has a lovely buttery flavour with a good chipotle warm smokiness. Apparently you can cook with it, but so far I have just used it in salad dressings. And the technique is this - you marinate the prawns in lemon and bicarbonate of soda before dredging in flour and frying. 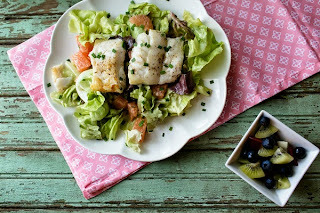 It works extremely well although I am not entirely sure why..."
Pam of Sidewalk Shoes shares this summer-ready Cod with Grapefruit Salad and says, "Am I the only one with about 6 or 7 mason jars of various homemade dressings on the bottom shelf of their fridge? Most were made for a recipe and I put the leftovers in my fridge, planning on using them later on something else. Well, I wasn’t going to let this wonderful dressing with it’s earthy hints from the sesame oil and sweet heat from the ginger go to waste! I remembered reading about a cod and grapefruit salad from Eating Well. 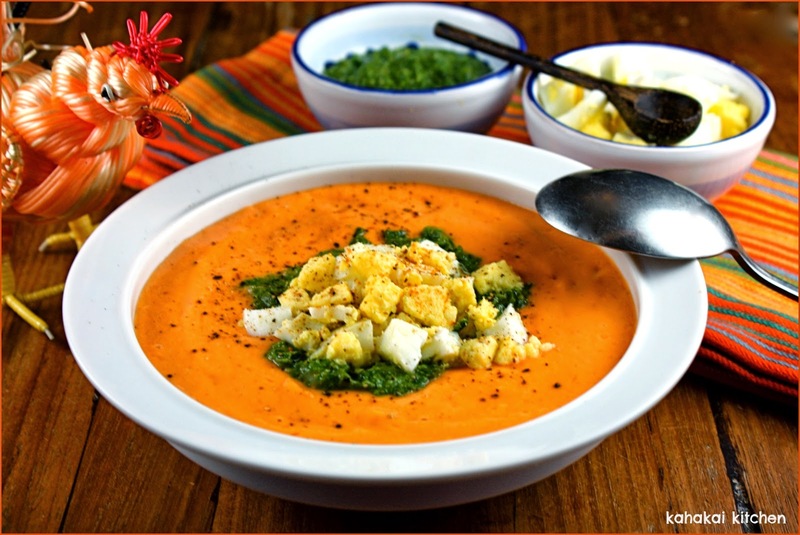 That combination sounded like the perfect backdrop for the ginger dressing – and it was!" Thanks to Foodycat and Pam for joining in this week. If you have a soup, salad, or sandwich that you would like to share, just click on the Souper Sundays logo on my side bar for all of the details. Where does the month go? It's time again for Food 'N Flix--time to cook a dish inspired by a movie. 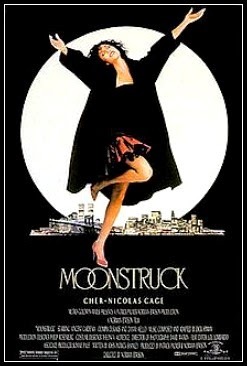 Our selection for June, hosted by my friend Debra of Eliot's Eats, is the 1987 romantic comedy Moonstruck starring Cher, along with Nicolas Cage, Olympia Dukakis, Danny Aiello, and Vincent Gardenia. "La bella luna! The moon brings the woman to the man. Capice?" Cher plays Loretta Castorini, a widowed Italian bookkeeper from Brooklyn whose husband was killed in a bus accident several years earlier. (Loretta believes her first marriage was cursed because they got married at City Hall instead of doing it right at the church.) She decides to make a safe choice and marry Johnny, a nice, mild-mannered friend of her late husband even though she really isn't in love with him. When Johnny goes to Italy to see his dying mother, Loretta meets his estranged younger brother Ronny and on the night of a huge, glorious full moon, she begins to feel passion and feelings for Ronny that are missing from her relationship with Johnny. I had not seen this movie in years and was happy to find it conveniently playing on HBO all this month so I set my DVR to record it and then sat down for trip back to visit 80's Cher and Nic Cage. I was a little surprised at how much I enjoyed it--I am a serious repeat movie watcher when I like/love a movie and the fact that I never made an effort to watch this one again led me to think I must not have been impressed. But, it is funny, sweet, a bit quirky, and you can see why Cher won the Oscar for her performance and the always delightful Olympia Dukakis won best supporting actress for her role. Nigel says, "First, dinner. Basil leaves, a good couple of handfuls, a clove of garlic, a teaspoon of Dijon mustard, a couple of tablespoons of white wine vinegar, a teaspoon of capers, pureed with enough olive oil to make a thick pouring consistency. Stir in 2 or 3 tablespoons of cream and some salt and pepper, then toss with a bowl of cooked cappelletti. 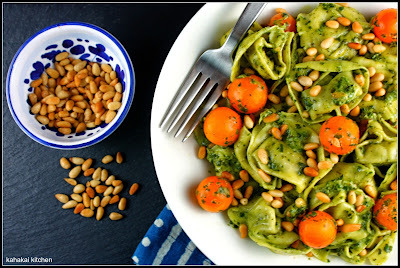 Pine nuts, toasted in a nonstick pan, get chucked on top after the pasta and sauce have met." 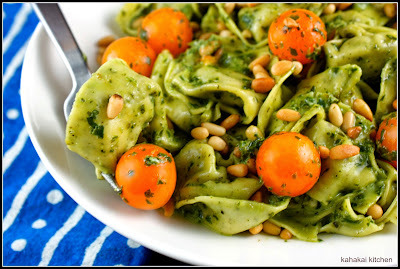 Notes/Results: Such a great quick pasta sauce and a dish with lots of flavor--it's like a creamy pesto with a slight tangy, briny edge. I liked how the sharper elements--the basil, capers (I doubled the amount), mustard and white wine vinegar were mellowed by the cream. Definitely a dish I wanted more of. Using fresh pasta, it took less than 15 minutes to make--most of that boiling the pasta water. The sweetness of the little Kahuku Golden tomatoes was a nice contrast to the sauce and the buttery, nutty toasted pine nuts added a good touch of crunch. Since the tortellini I used was stuffed with basil and Parmesan, I didn't feel like it needed any additional cheese but you certainly could grate some in if you wanted to. I really liked the sauce and will definitely make this again. 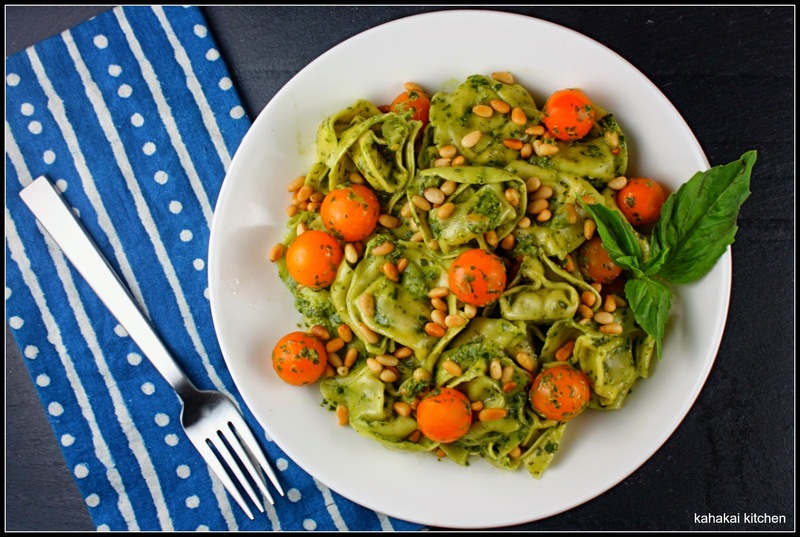 In addition to Food 'N Flix, this pasta is doing double-duty at I Heart Cooking Clubs where our theme this week is Mediterranean Magic. You can see what everyone made by checking out the picture links on the post. The deadline for this round of Food 'N Flix is tomorrow, Friday, June 27th and Debra will be rounding up the entries on her blog soon after. 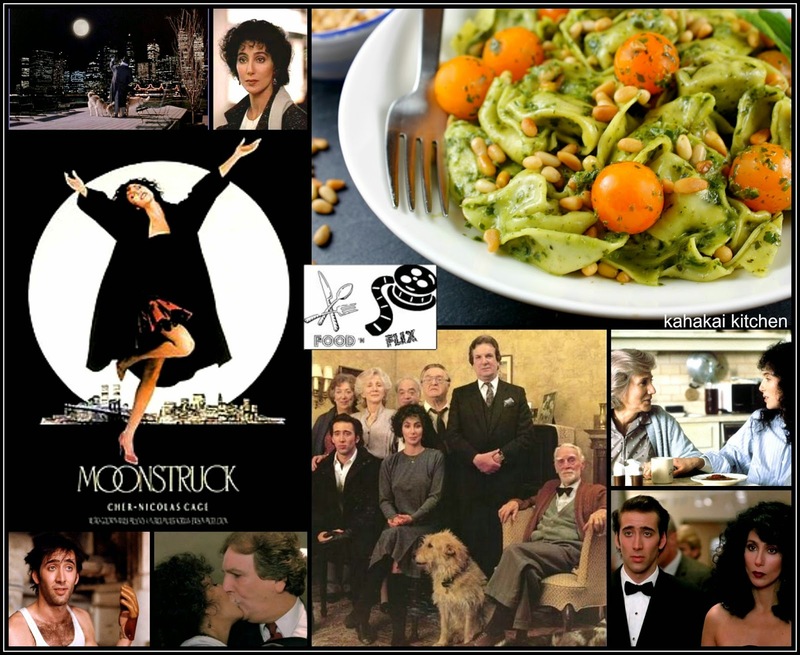 If you missed out on Moonstruck and love food, films and foodie films, come join us for July when we will be watching and cooking from one of my favorite foodie movies, Like Water for Chocolate, hosted by Elizabeth at The Law Student's Cookbook. "Elizabeth is missing"--it's the thought that keeps popping up in Maud's confused mind, a mystery she needs to solve but she can't seem to remember anything long enough to find out what happened to her friend. The little notes and reminders she leaves herself aren't helping and no one seems to want to listen to her. Elizabeth's disappearance also takes Maud back seventy years to when her older sister disappeared, never to be seen again. Is there a connection? Elizabeth is Missing is an absorbing and suspenseful first novel by Emma Healey, and Kahakai Kitchen is a stop on its TLC Book Tour. 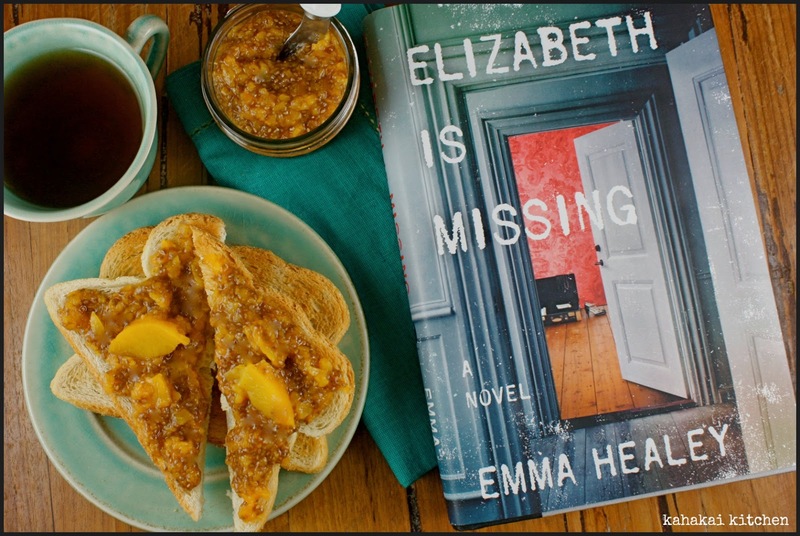 Elizabeth is Missing is a book that pulls you in and builds the angst with every page. A book about a woman in her eighties trying to find out what happened to her best friend while her mind disintegrates and her anguish and anxiety build shouldn't be this captivating, but it is. The story, told from Maud's view, jumps back and forth between the past and present day and, as jumbled as her mind is, the book had me constantly guessing--what was past, what is present, what is real, and what isn't? Maud is a smart lady, easy to care about and feel sad for as her confusion grows. As dark and poignant as Maud's story is, author Healey masterfully slips in a touch of dark humor that had me if not laughing, at least grinning. As good as it was, this book was a bit hard for me to read. At 82, my mom is Maud's age and her short-term memory has deteriorated in the past couple of years--although certainly not to Maud's level, nor has she been diagnosed with dementia or any conditions of the mind. Still, I find myself getting frustrated at times that she doesn't remember something we discussed at length the day before, or that we sometimes need to play guessing games to find a word she can't remember. As any child of an aging parent knows, it can be frustrating to have to dial back the impatience that naturally arises and both sad and hard to control your fears that this person who nurtured you all of those years won't always be around and able to continue loving you. Elizabeth is Missing brought that home for me. Still, I recommend it as a great read and an amazing first novel from a talented author--just know that it has some tough-to-read themes. 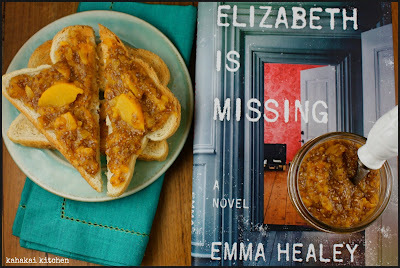 Author Notes: Emma Healey holds a degree in bookbinding and an MA in creative writing. Elizabeth Is Missing is her first novel. She lives in the UK. 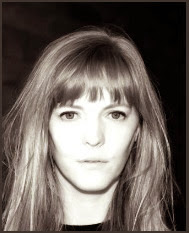 Find out more about Emma at her website and connect with her on Twitter and Facebook. There is actually a food presence in the book--it's just with Maud's getting lost in her mind, some of that food repeats itself over and over primarily summer squash (Maud repeatedly asks people the best place to grow it) and the canned peaches she keeps buying much to her daughter's dismay. What does one do with all of those canned peaches? I decided to help them out and utilize the fruit in some peachy jam to go with the toast Maud likes to eat--although cooking is something she is not allowed to do for herself anymore. Wanting a quick, effort-free and healthy jam, I decided to make it with chia seeds. No cooking required--just some pulses in the food processor and time to set up. Works for me! Another thing that works for me is cinnamon to jazz up the canned peach vibe a bit. I think Maud would like it. Pulse peaches, lemon juice, cinnamon, vanilla and sweetener in a food processor to the consistency you desire. For a chunky jam, pulse less time, pulse longer for a smooth jam. Place in a bowl or jar and stir in the chia seeds thoroughly. Let sit for 30 minutes, then chill in the fridge for an hour or two--so that the chia seeds have jelled and thicken the jam. 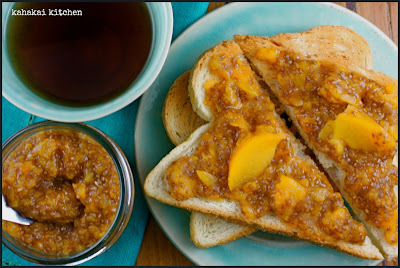 Serve on toast, with a cup of tea. 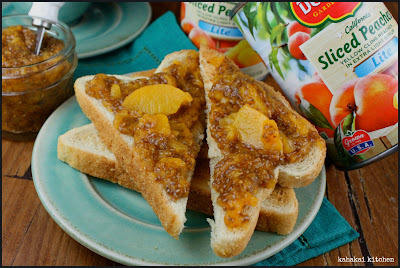 Notes/Results: A nice little jam with chunky texture and good peach and cinnamon flavor. Of course it would be amazing with fresh peaches but as a way to use up canned fruit, it works really well. The lemon juice and vanilla round out the flavors, as does the maple syrup. 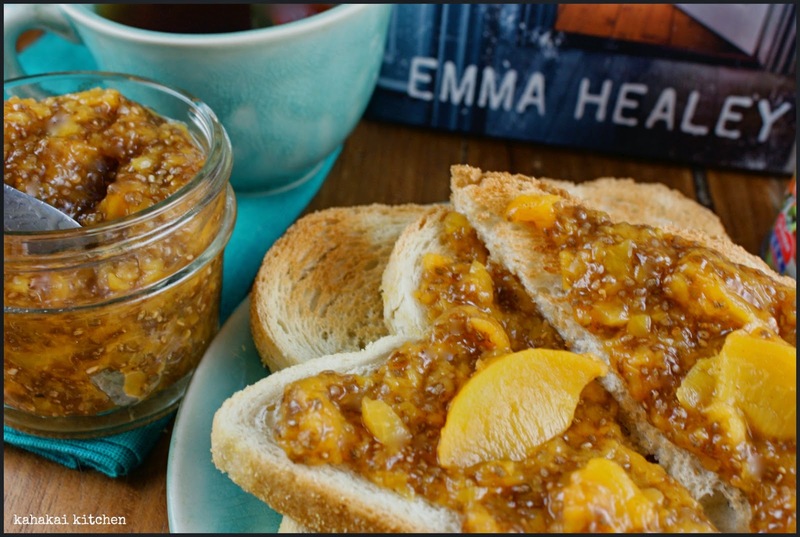 It's sweet but not too sweet which I like and is perfect on crisp toast for breakfast or a snack. It was even better when accompanied with some slightly spicy black chai tea. This is a fast and easy jam that tastes great and anything made with chia seeds has added nutrients and is just plain fun. I would make it again. This post is being linked up at Novel Food--celebrating food inspired by the written word and hosted by my friend Simona at Briciole. This deadline for this round of Novel Food ends today June 23rd. 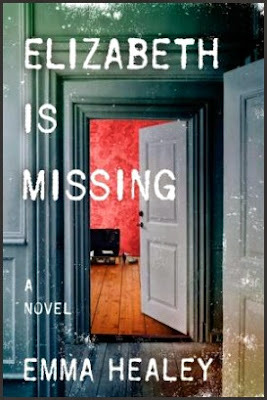 Note: A review copy of "Elizabeth is Missing" was provided by the publisher and TLC Book Tours in return for a fair and honest review. I was not compensated for this review and as always my thoughts and opinions are my own. Sometimes a week just gets away from you. I have been madly trying to meet a writing deadline for a workshop I am delivering in a couple weeks and have had my head down and my blurry eyes focused on the computer. Little time to focus on much else like a soup for today's Souper Sundays. When I did take time to stick my head in the kitchen, I wanted something easy and for it to come from the pantry and fridge and not require a trip to the store. I was craving something tomatoey, a bit brothy, maybe some beans and rice, definitely some spice.I have made tomato rice soups before but I thought it would be fun to put more of an Indian flare to this one and along with garlic and ginger, use garam masala and cumin and use basmati rice. It turned out to be a good idea, giving me a thick and satisfying soup with plenty of flavor. I like soup with a good topping and I was going to add some chutney to this one when my eye was caught by a container of leftover hummus. Stirring it into the soup gives it a layer of creaminess that takes it from really good to really great. In your soup pot, heat olive oil over medium heat. Add onion and carrot and saute for 5 minutes, until vegetables have softened and onions are translucent. Add garlic and ginger and saute for another 3 minutes, then add garam masala and cumin and saute for 1-2 minutes, until you can really scent the spices. Add the rice, tomatoes, chickpeas and broth to the pot and bring to a boil. Reduce heat and simmer for 20 minutes or until rice is cooked and vegetables are cooked. Season to taste with salt and pepper and if you like, a squeeze of fresh lemon juice. 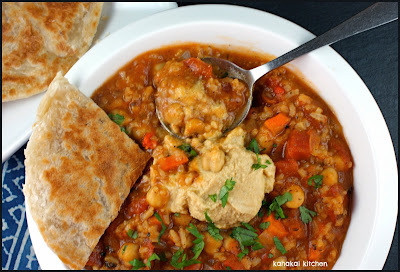 Serve with chopped fresh cilantro and a small scoop of hummus (optional but highly recommended). ;-) Enjoy with a piece of paratha or naan. Notes/Results: This is a good one. It's a thick soup with the rice, beans and pieces of tomato and carrot, but not at all heavy. The garam masala and ground cumin add great flavor with a touch of heat from the red chile and it is brightened up from a squeeze of fresh lemon juice. Although not necessarily in keeping with the Indian-spice flavor profile, the hummus is a perfect touch--great to mix into the soup or to dip some paratha in. 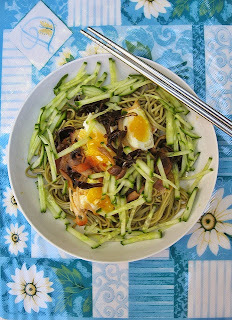 A happy combination of flavors and textures, I would make this again. 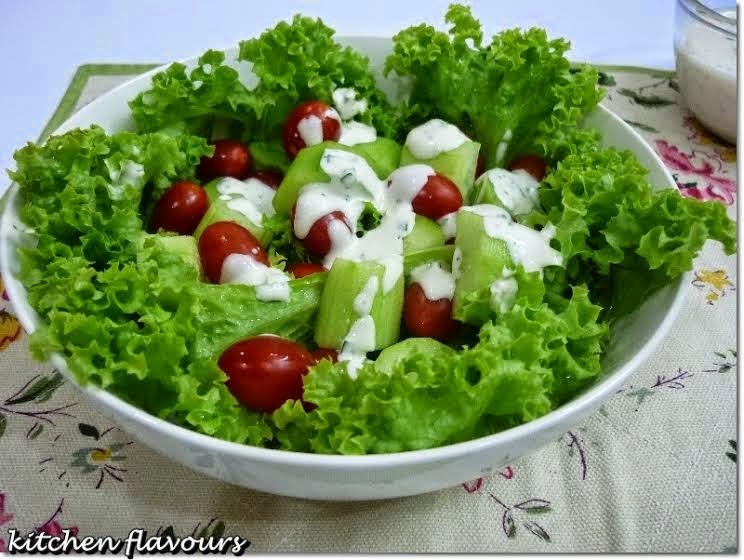 Joyce of Kitchen Flavours is here with a refreshing Lettuce, Cucumber, Cherry Tomato Salad with Ranch Dressing. 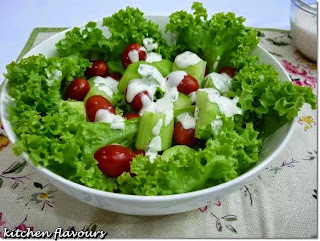 She says, "This is a really simple salad, easy and quick to put together especially if you are rushing for time when preparing the main dishes. Another lovely recipe from The Deen Bros. The Ranch Dressing is so yummy, we love it! According to The Deen Bros., any extra dressing can be used as a dipping sauce for chicken fingers or chicken wings, and can be covered in the refrigerator for a week. We like all the flavours in the dressing; the garlic powder, onion powder, black pepper, minced garlic, chopped fresh chives, parlsey, mayonnaise, milk and white wine vinegar." 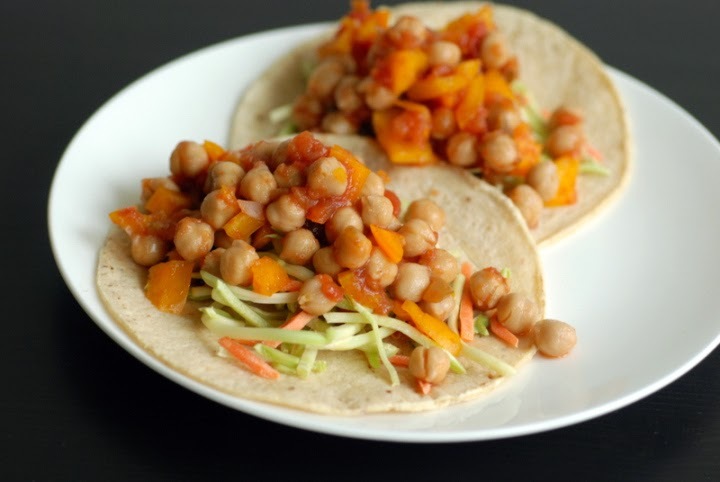 Janet of The Taste Space shares her variation on a sandwich, these Quick & Easy Salsa Chickpea Tacos. She says, "I envision this as the perfect travelling meal – mix and eat. Until then, it will have a happy place in my kitchen. Mix some salsa with chickpeas and chopped bell pepper. Throw it overtop some shredded broccoli and carrots for more crunch on a taco shell, and you’ve got a meal. I topped mine with a healthy dose of nutritional yeast which became creamy and gooey with the extra salsa. Totally not optional for those who love nooch." My friend and fellow I Heart Cooking Clubs co-host Kim of Stirring the Pot brings these cute Giada De Laurentiis Mini Meatball Sliders and says, "This is definitely a family friendly meal that worked for us. The kids were tricked into eating the meatballs because they were placed inside a fluffy, soft, sweet little roll. Plus, ketchup and kids just go together. Put a little ketchup on that meatball and you're good to go." Thanks to Joyce, Janet, and Kim for joining in this week. If you have a soup, salad or sandwich to share, just click on the Souper Sundays logo on my sidebar for all of the details. 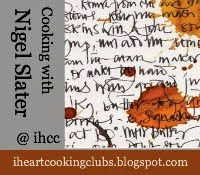 A quick and easy little salmon recipe from Nigel Slater, perfect for a busy night. I was going to make a salad but then decided to saute the remains of a bag of baby spinach with garlic and sesame seeds and add a few sweet baby tomatoes. Simple and satisfying. 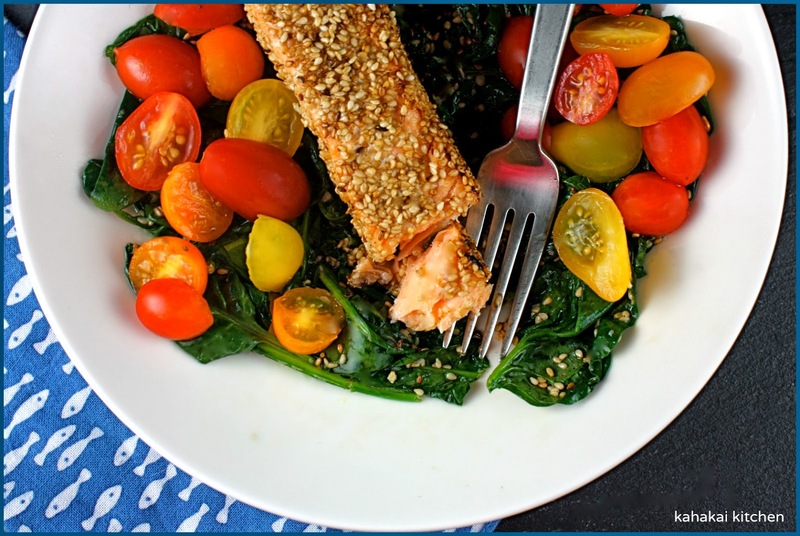 Nigel says, "A deliciously simple way to cook a salmon fillet - sweetened with rice wine and sesame then pan-fried." Marinate the salmon in a bowl with the mirin, groundnut and sesame oils for 30 minutes. Fill a plate with sesame seeds and place the salmon flesh-side down to cover evenly. Pan-fry the salmon for six minutes skin-side down and then turn for three final minutes of cooking. 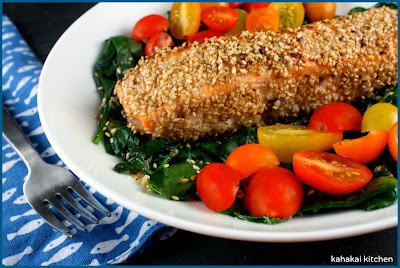 Notes/Results: The salmon had good sesame flavor with a hint of sweetness from the mirin. I felt like it needed just a pinch of salt to bring out the full flavor and I also squeezed a lime wedge (I was out of lemon) over the top for a hint of brightness. The salmon turned out really moist and tender, always a plus. Besides the time for marinating, this dish takes just a short time to make--nice when you don't have the time or inclination to fuss. With the sauteed spinach and tomatoes, it made for a great light dinner. I will make it again. 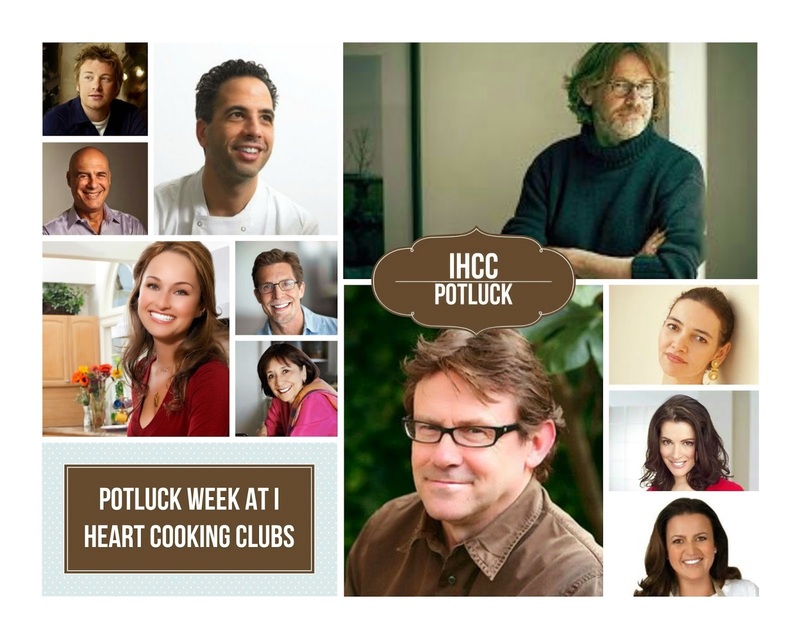 It's Potluck this week at I Heart Cooking Clubs--our time to make any Nigel Slater dish or a dish from any former IHCC chef. You can see what everyone made for Potluck by checking out the picture links on the post. 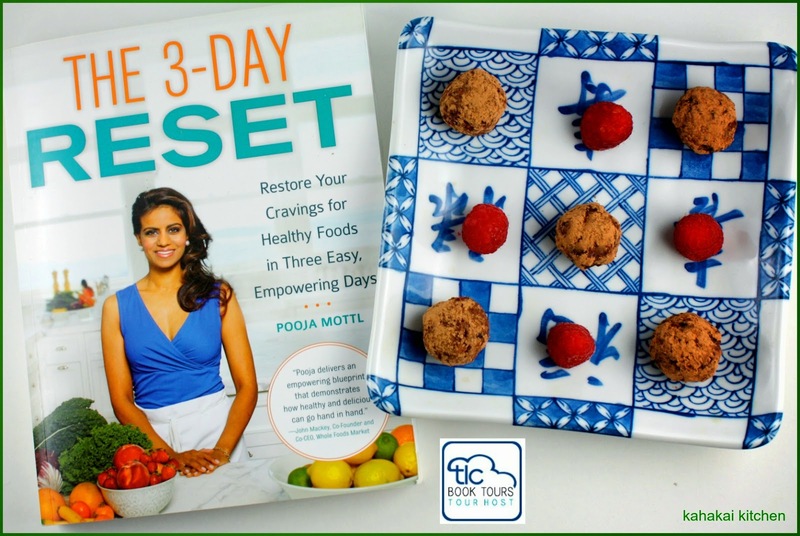 About a month ago I posted a teaser for a new healthy living book, The 3-Day Reset: Restore Your Cravings for Healthy Foods in Three Easy, Empowering Days by Pooja Mottl. (You can find the teaser post with excerpts from the book here.) Nutrition and healthy eating are a passion of mine and I like the author's focus on replacing less healthy and quality foods with what she refers to as WAMPs (Whole And Minimally Processed Foods). 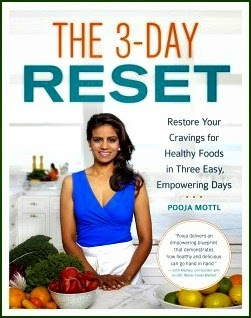 in 3-day "resets" to adjust the taste buds and get the body accustomed to new foods in a 'doable' time frame. Although in general I eat pretty healthy and don't find myself 'addicted' to any processed foods--like everyone, I do get cravings from time to time. I am fond of chocolate and do indulge in a few coffeehouse beverages a week so for my stop on this TLC Book Tour, I read through the book, followed many of the tips and ideas for the chocolate and beverage resets, and road-tested a few different recipes that caught my eye. "Eating healthy can be a struggle. It’s hard to choose broccoli and brown rice instead of hot, cheesy pizza. And diets often ask you to cut out different foods all at once, leaving you feeling deprived. 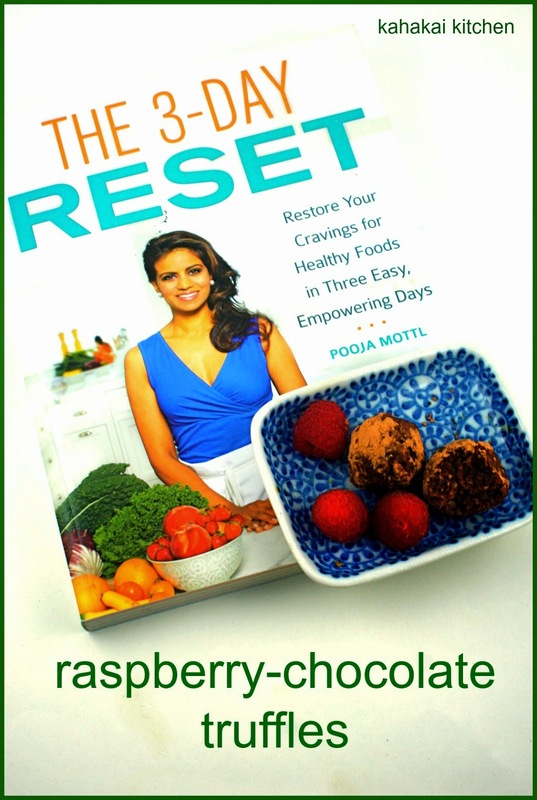 Accessible, fun, engaging, and packed with over 30 delicious recipes, pantry makeover lists, shopping guides, tidbits on food history, and other smart tools, The 3-Day Reset will set you on the course to healthy eating… and help you stay there for good." Overall, I like this book as I think it delivers on its premise--being aware of the quality of the food that you eat and offering relatively simple ways to eat better for your health and wellness. The 3-Day resets aren't threatening and while not necessarily enough time to form new habits, they are enough to give a taste (pun intended) of healthy eating that can inspire someone to keep going. There are 10 different resets: sugar, salt, wheat, chocolate, yogurt, chicken, salad, beverages, take-out food and breakfast so the reader can pick and choose the ones that pertain to them and/or complete one before moving on to the next to reset their diet over time. There is good background information and data on healthy eating and the 'whys' behind the resets and it is given in easy terms and a colorful format that keep it from being too clinical or boring. The recipes are generally easy to follow and I really liked three out of the four recipes I tried. If this is someone's first exposure to healthy cooking and eating, some ingredients may be unfamiliar and daunting, and some a bit expensive to buy at once. A few more tips on eating healthy and buying WAMPs on a budget could have been helpful. I also would have liked to see a few more recipes added to some of the broader resets (sugar, salt, wheat) to give more variety to the 3 days. 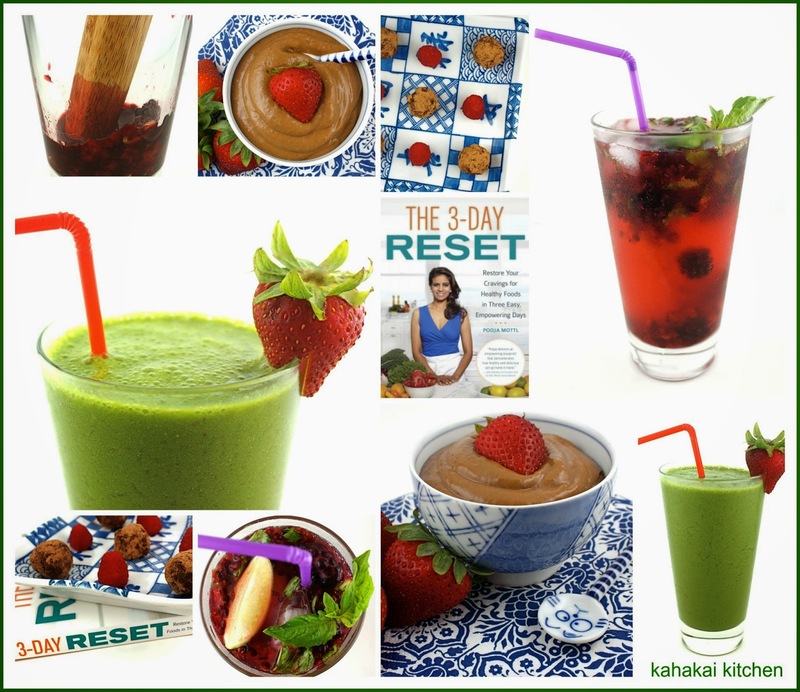 Still, if you are interested in better health and improving your food choices without too much pain, The 3-Day Reset is a great resource to get started. Author Notes: Pooja Mottl is a professionally trained Natural Foods Chef, Healthy Eating Coach, and Healthy Living Expert whose work has captivated audiences from Good Morning America to the Huffington Post. She is a graduate of the Natural Gourmet Institute, a world-renowned institution for pairing culinary training with health promoting food. Pooja also holds a certificate in Plant Based Nutrition from Cornell University and is an NSCA-CPT certified personal trainer. Pooja advises private clients on healthy eating and has taught cooking classes at Whole Foods Market. She regularly blogs for the Huffington Post and Gaiam.com. Pooja has appeared on Good Morning America, WGN TV, Martha Stewart Radio, Style.com, the Green Festival, HuffPost Live, and a variety of additional media outlets. As part of reviewing the book, I tried four different recipes: Dreamy Green Strawberry Almond Smoothie (Wheat Reset), (Virgin) No Sugar Blackberry Lime Rickey (Beverage Reset), Strawberry Chocolate Mousse (Sugar Reset), and the Raspberry Chocolate Truffles (Chocolate Reset) that I am sharing below. Still to be tried are the Chinese Peanut Noodles (Take-Out Reset), Banana-Cinnamon Rice Cereal (Wheat Reset), Two Bean Tuscan Soup (Salt Reset), Tofu Curry Scramble (Breakfast Reset). Doesn't it all look fresh and healthy?! Dreamy Green Strawberry Almond Smoothie: A good green (from spinach) smoothie, thick and creamy with the perfect level of sweetness from the dates. The recipe called for 5 frozen strawberries, next time I'll add a few more so the berry flavor is more prominent than the banana and it will move up to great. Strawberry Chocolate Mousse: I knew I would like this recipe, I wanted badly to like this recipe but unfortunately, it just didn't do it for me. I felt like the combo of ripe strawberries, cacao, avocado, coconut milk and whole cane sugar that sounded great on paper just wasn't 'enough' of anything for me--not creamy enough, not rich enough, not chocolaty enough, not enough strawberry flavor. It wasn't terrible but it didn't wow me. I ended up loading a plate up with fresh fruit and using it as more of a dip than a pudding. Pooja says, "Two ancient ingredients--cacao and dates--make this WAMP recipe perfect for vital living. 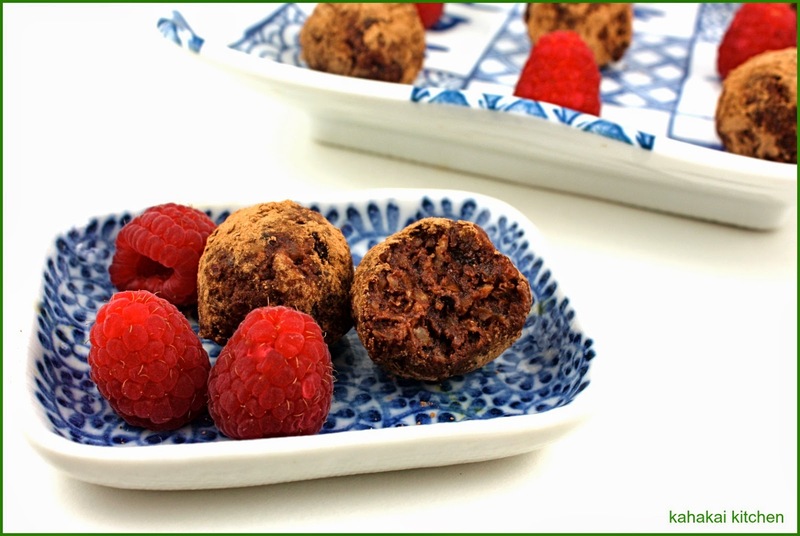 Combined with ripe raspberries, these truffles are the perfect companion to a hot cup of coffee or tea." Pour a small amount of cacao powder onto a sheet or large plate for coating and dusting the truffles. Add all ingredients to a food processor or blender, and blend until ingredients are fully incorporated and pecans and dates are chopped into small bits. Be careful not to overblend. If the mixture looks too dry, add a couple of extra raspberries. Scoop out the truffle mixture using a tablespoon. Scoop 1 1/2 tablespoons at a time, forming each into a ball with your hands. Transfer balls to dusting plate and coat thoroughly, then tap the truffle to remove any excess powder. Enjoy immediately with tea or coffee or chill in the refrigerator for an hour or more. Truffles will last in the fridge for several days. Notes/Results: In addition to having good flavor and being a satisfying bite, these little truffles go together quickly and easily. I actually had everything on hand but the raspberries to make them, which made it even easier to put them together. My mixture was a bit dry with the 1/4 cup raspberries, so I actually put in about 1/3 cup total. They were then very moist and the raspberry flavor popped. Definitely something I will be making again and I have it in my mind to try some blueberry ones next. 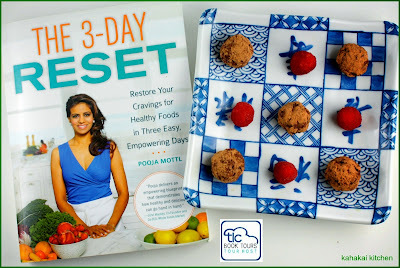 Note: A review copy of "The 3-Day Reset" was provided by the publisher and TLC Book Tours in return for a fair and honest review. I was not compensated for this review and as always my thoughts and opinions are my own. You can see the stops for the rest of the TLC Book Tour Release Week Teasers and Reviews here. The first cold soup of the season is here! ;-) Not because it is particularly hot today, but because my beloved Haas avocados were 5 for $5.00 at Whole Foods on Friday and I bought a bunch of them. 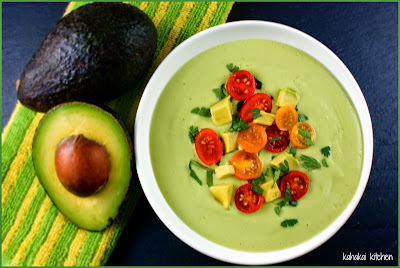 I have posted plenty of avocado soups here (just type in avocado soup on the search function of this blog to see them). Many were blended with other ingredients (watercress, cucumber, zucchini...), but I liked the simplicity (and ease) of Mark Bittman's Fast Avocado Soup. A few minutes in the blender and then time to chill is all it takes. I used coconut milk to keep it vegan/dairy free. 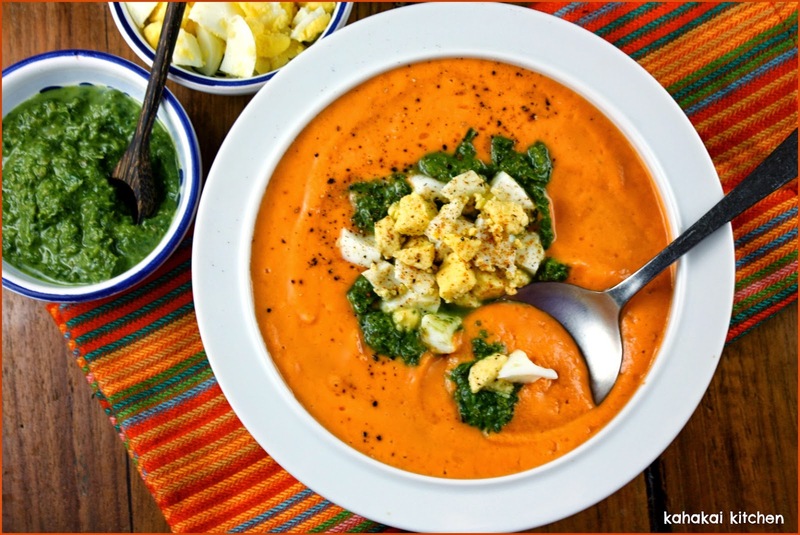 Mark Bittman says, "Creamy, with a gorgeous color, this soup couldn’t be simpler. If you like, dress it up with chopped cherry tomatoes, sliced scallion, chopped chervil or mint, or a dollop of crème fraîche (or any of those in combination). Or see the variation for some seafood additions." Put the chopped avocado in a blender. Add half the milk, a large pinch of salt, and a small pinch of cayenne and process to a purée. Beat in the remaining milk, then chill for up to 6 hours if you have time (press a piece of plastic wrap onto the surface of the soup so it doesn’t discolor). Taste and adjust the seasoning if necessary, add the citrus juice if you’re using it, and serve—in chilled bowls if you want to be precise. 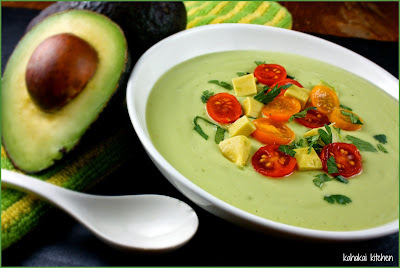 Variation: Fast Avocado and Seafood Soup. Before preparing the soup, chop some boiled shrimp (or if you have any leftover grilled, use that) or cooked crabmeat. If you like, toss it in a little vinaigrette, but a little salt and pepper and a squeeze of citrus is just fine. Chill while you prepare the soup. Serve a spoonful of seafood on top of each bowlful. Notes/Results: Rich and creamy, slightly tart with a slow kick of cayenne at the end, a simple and tasty cold soup. 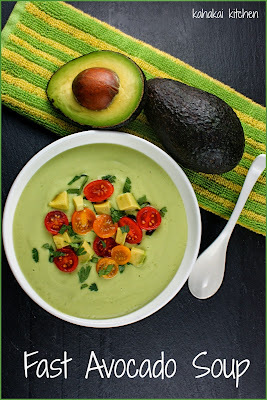 I know blended avocado isn't everyone's cup of tea bowl of soup, but it is worth a try if you are an avocado fan. 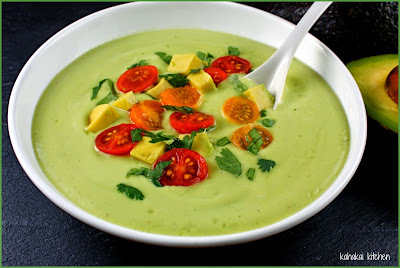 This soup goes together in a few minutes and if you put your milk (in this case I used coconut milk), blender jar, and avocados in the fridge for a couple of hours before you make it, it doesn't take long to chill after blending. 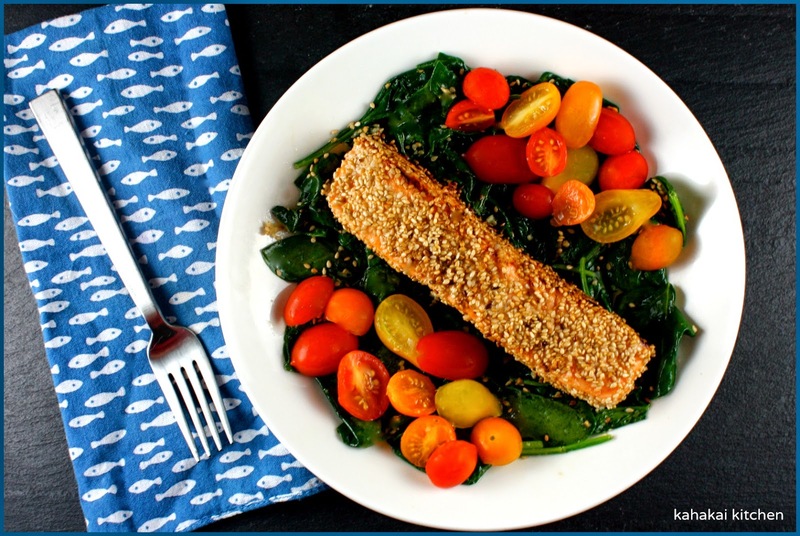 Bittman suggests adding cooked seafood on top as a variation. I topped mine with chopped cilantro, diced avocado and halved cherry tomatoes and then I topped another bowl with some cold leftover salmon which was also good. This one would be a good starter for an elegant lunch, or a Mexican dinner enjoyed on the patio. I would make it again. It's Potluck this coming week at I Heart Cooking Clubs--our time to make any Nigel Slater dish or a dish from any former IHCC chef, like Mark Bittman. 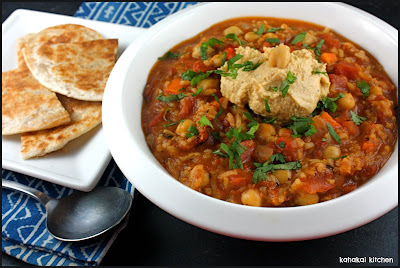 I'll be linking this soup up once the post goes live and you can see what everyone made for Potluck by checking out the picture links on the post. It's a busy day in the Souper Sundays kitchen and we have some fabulous friends and their creations waiting --let's have a look! Joyce of Kitchen Flavours shares this pretty bowl of Noodles, Chicken Broth and Chives and says, "Really nice! I ate this with some chillies from my potted garden, sliced and mixed with some soy sauce. The broth is really nice, especially since I've used my homemade chicken stock instead of water, and I like the light lemony taste of the broth. I did not squeeze over anymore lemon juice over the noodles, as it is already good as it is. Having the chives whole as it is in a soup is really a very Chinese way of eating it, as chives are usually left whole when it is cooked with Chinese wheat vermicelli, which is usually cooked when celebrating a birthday for the elderly, as it represents long life with many more birthdays to come!" 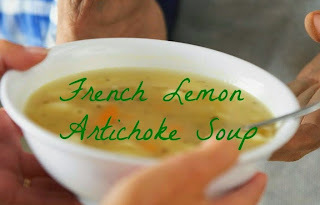 Judee of Gluten Free A - Z Blog brings us flavorful French Lemon Artichoke Soup and says, "This lemony mixture of artichokes, onions, celery, zucchini, and young potatoes is a delectable soup that reminds me of the Middle Eastern version of the traditional French recipe Ratatouille. Same idea; different ingredients. 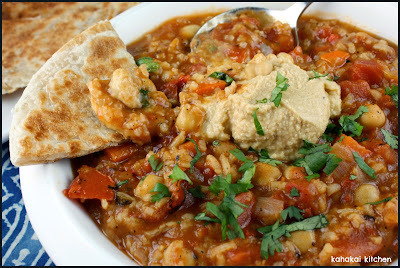 Cooked until soft and blended, " chamid" is often eaten over rice ( Basmati is great). To make it a complete meal, just add 1 cup of cooked chick peas." 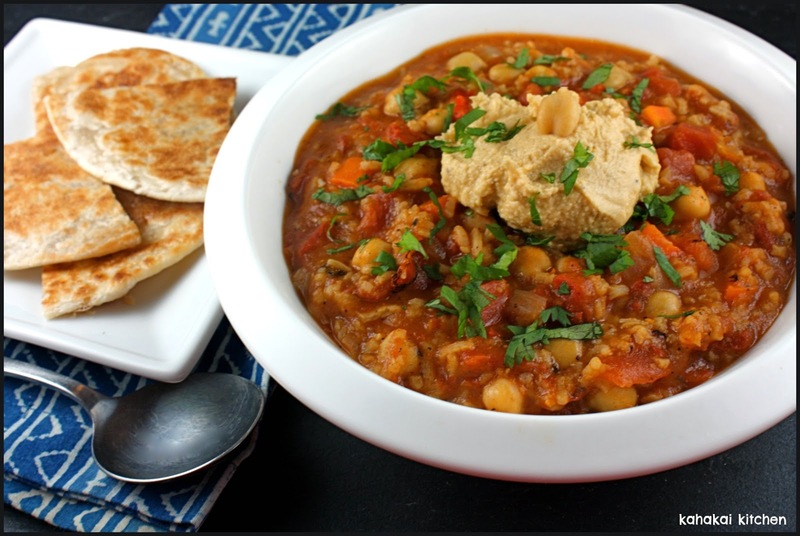 My friend and fellow IHCC co-host Sue of Couscous & Consciousness is here with a budget-friendly bowl of Curried Carrot, Lentil & Roasted Tomato Soup and says, "The verdict: This could not taste less like "just a bunch of boiled up carrots". My carrot soup phobia is over. 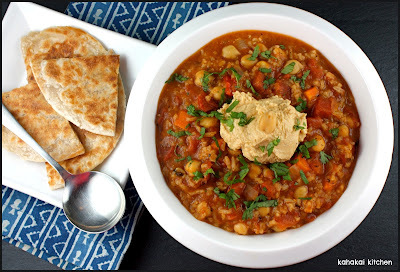 This soup is heavenly ... plenty of sweetness from the carrots, balanced out by the roasted tomatoes, some earthiness and "comfort" from the lentils, sweetness and fragrance from the coconut milk, and a little heat from the curry powder. 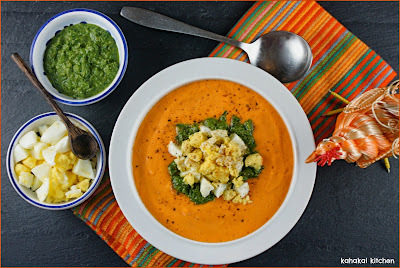 I will definitely be making this soup again, and next time I'm going to try replacing the curry powder with a little harissa - I think the flavours would be great with the carrots and tomatoes, and the kick of heat won't go astray either." Mireille of Chef Mireille's East West Realm has a soup and two salads to share this week. First up, her summer-ready Thai Cabbage Corn Soup. 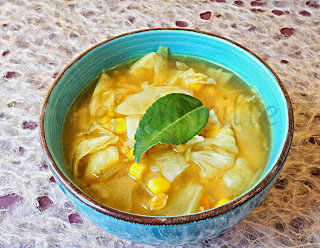 She says, "Corn is one of my favorite foods and during the summer when fresh corn both of the yellow and white variety is available in abundance is when corn is the star on my table a few times a week. ... I used Thai flavors in this simple soup as the pantry was full of them after a recent event I hosted with lots of Thai food. This soup includes that delicate dance that Thai food always has with sweet, salty, spicy and tart." 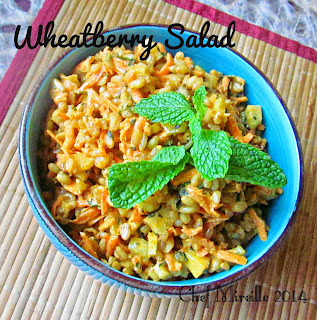 Mireille's first salad is this hearty Wheatberry Salad, She says, "How about trying this version instead of the usual macaroni salad. 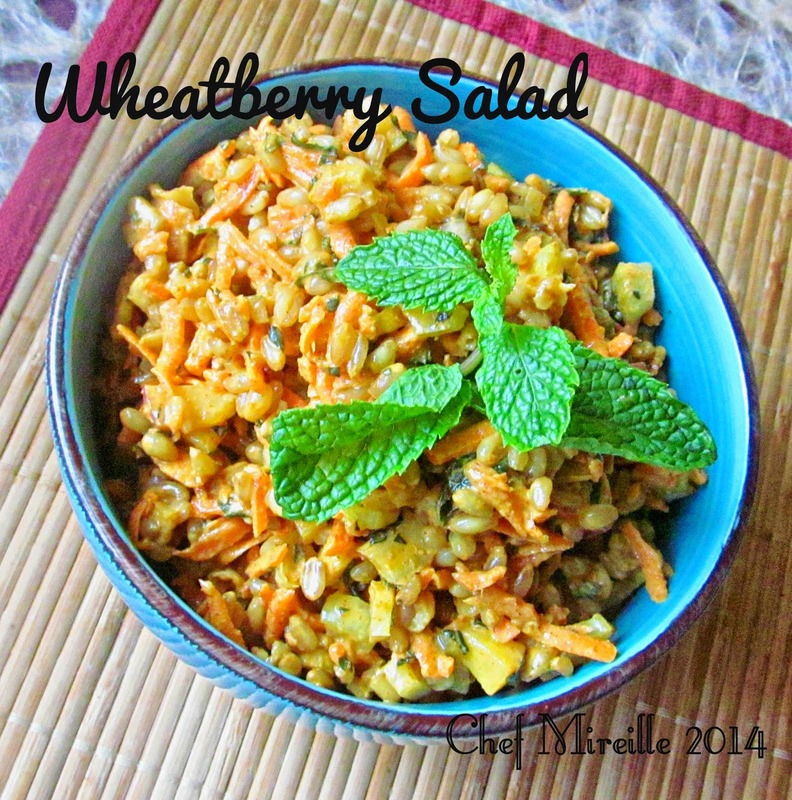 Using whole wheat berries is a fiber rich way to still enjoy this tasty salad. ... Whole Wheat berries are a great alternative to rice, with much more added health value. However, it will take a little getting used to the texture if you are used to soft rice or pasta. It has more bite to it and is more chewy." 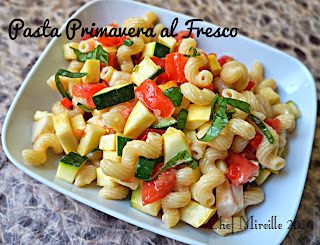 Mireille's final dish this week is a veg-filled pasta salad, Pasta Primavera al Fresco. 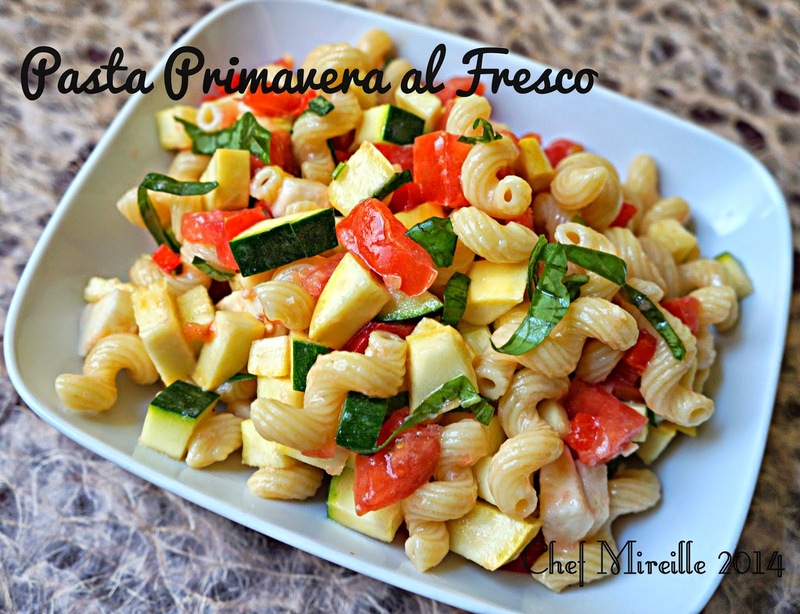 She says, "This pasta dish is perfect for summer as it is made with an uncooked sauce. It is cool, refreshing and light. The traditional Italian version only includes tomatoes, garlic, olive oil and basil along with the cheese. If you can get smoked mozzarella, it is even better. I didn't have time to get to the specialty cheese store so I had to use plain old mozzarella. However, since I had a bunch of veggies in the bin, I added some vegetables to make this dish healthier and more vegetable rich." 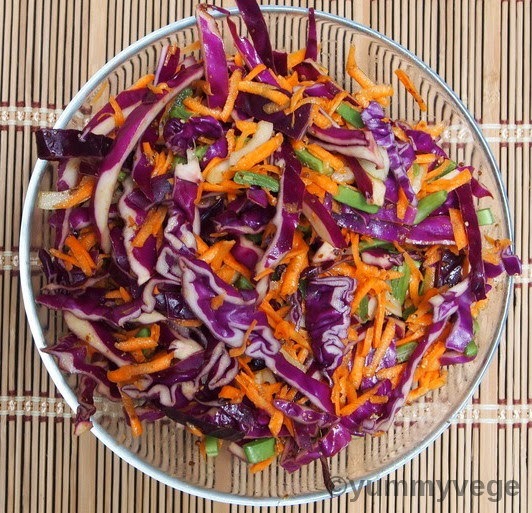 Jo of yummyvege is back this week bringing colorful Red Cabbage Salad with Miso Dressing. Jo says, "Today I bring you a salad which is crunchy, and maybe a bit different to what you eat most days and of course totally yummy. It’s quick and easy to make. Make sure you use the dressing though as this is what makes it really special. A fab mix of salty from the miso and sharp from the lime and vinegar. I served this with sauteed seitan and a baked potato." Pam of Sidewalk Shoes walks on the veg-side with this Spicy Bean and Quinoa Salad with "Mole" Vinaigrette and says, "I am not a vegetarian. There is nothing I like better than a perfectly cooked ribeye. However, like many of you, I do try to limit my intake of meat. So, an occasional meatless meal works it’s way onto my weekly menu. Let me just say that if all of my endeavors into meatless eating ended like this one, I might give the whole vegetarian thing a little more thought. This was wonderful. 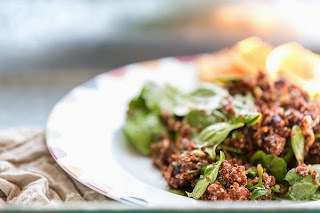 It was super easy and the “Mole” vinaigrette gave it such a wonderful flavor. You couldn’t quite tell what the flavor was, you just knew that it was good." 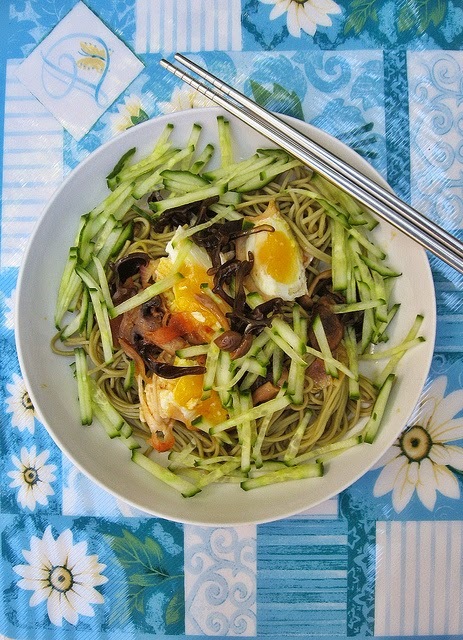 Tigerfish of Teczcape - An Escape to Food made this Mushrooms, Cucumber Noodle Salad and says, "There are a few things that I like to do in batches e.g making hard-boiled eggs. I would typically make four to six at one go and store them in the fridge. At least when I don't prepare any proteins on any other day, this is the source of protein. ... I also like making a base (concentrated) of tomatoes, onions, garlic in advance, and sometimes add mushrooms. This can be useful when making soups, add some noodles if you wish to make a one-dish meal. 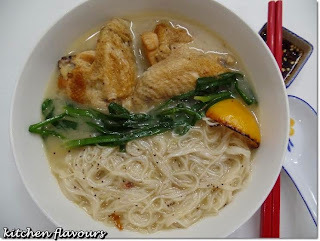 If you want a less-mess soup-less version, heat up the base sauce, toss with noodles or pasta and then serve with easily prepared toppings e.g. cucumber, hard-boiled eggs (or sliced egg muffins)." And Janet of The Taste Space shares these salady Laotian Tofu Larb Lettuce Wraps and says, "This is a spin on Laotian larb. Of note, Rob tells me this is nothing like the original and in fact, if you pronounce the r in larb, that is wrong, too. 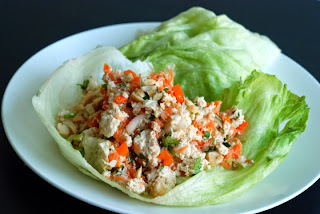 Make no mistake about its simplicity, this salad wrap was GREAT! A few fun points: This was the first time I have steamed tofu. I LOVED it. It made it nice and fluffy and once crumbled, it absorbed the flavours of the marinade incredibly well. Lime juice, cilantro, in a salty-hot-sweet background, it was nice, fresh and light. After an overnight soak, it was absolutely perfect and lasted for a few days of lovely leftovers for lunch." Thanks to everyone who joined in this week! If you have a soup, salad, or sandwich that you would like to share, just click on the Souper Sundays logo on my sidebar for all of the details. Have a happy, healthy week and Happy Father's Day to all the dads out there!